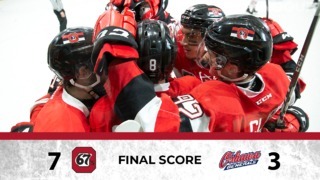 The Ottawa 67’s are back at home for a pair of weekend games starting Friday for Dunder Mifflin Night at The Arena at TD Place. After a tough road trip last week, the 67’s will look to get back into the win column in what will be the home debuts for newly-acquired forwards Kyle Maksimovich and Luca Chiodo. Goalie Mike DiPietro and forward Sasha Chmelevski, will also be back on home ice after spending time away at World Juniors. Ottawa, clad in their Office-inspired Dunder Mifflin jerseys, will host Peterborough on Friday night followed by a matinee meeting with the Hamilton Bulldogs on Saturday. Leading the London Knights by a single point atop the OHL standings, the 67’s will look to build a bit of cushion moving forward. Tye Felhaber still comfortably leads the OHL in goals with 47, a six-goal lead over his closest competitor for the goal-scoring title. Felhaber is also tied for the league lead in points with 75, all of that in only 43 games. His linemate, Austen Keating, leads the lead in assists with 46. Newly acquired Kyle Maksimovich and Lucas Chiodo made some good first strides with the 67’s, both putting up a goal and an assist during their first weekend in their new colors. 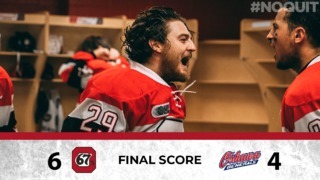 So far this season, Ottawa has a 1-2 record against the Petes and defeated the Hamilton Bulldogs 4-3 in overtime the only previous time they have played this year. To find out more about Dunder Mifflin Night, click here. Third in the East Division behind Ottawa and Oshawa, the Peterborough Petes made some pretty interesting moves at the trade deadline, especially the one that brought in star defenseman Ryan Merkley from the Guelph Storm. The San Jose Sharks prospect leads all OHL defencemen in points with 46 in 37 games so far this season, which is also good enough for the team lead, by a pretty good margin. Notable players on Peterborough are defenceman Declan Chisholm, who is the second leading point-getter for the Petes, as well as forwards Semyon Der-Argutchintsev (Maple Leafs prospect) and Liam Kirk (Arizona Coyotes prospect). In nets, Hunter Jones has taken on the majority of the responsibilities for Peterborough, with 37 starts. The 6”4 goaltender has notably amassed two shutouts over the course of this season. Fun fact, the Petes are the only team in the OHL to have an even goal differential, with 140 goals for and 140 against. A year removed from winning an OHL championship, the Hamilton Bulldogs haven’t done too bad for themselves. Some teams have a hard time bouncing back from losing all of their players after a championship year, which may be the case a little bit for Hamilton, but they still are a very competitive team. Led by 2019 potential first round pick Arthur Kaliyev, who has 66 points in 43 games this year, the Dogs have a lot to look forward to with this young player on their roster. Leading them along with Kaliyev is Philadelphia Flyers prospect Matthew Strome, brother of NHLers Ryan and Dylan. Another player to look out for who has recently joined Hamilton is 17-year-old son of Todd Bertuzzi, Tag. 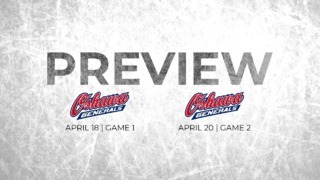 A young team looking to build towards the future, Hamilton has been playing well recently, winning their last two games and five of their last ten, including a thrilling shootout loss over powerhouse Niagara, proving they can go toe to toe with any team in this league. With 47 goals, there is a chance that Tye Felhaber hits the 50-goal mark this weekend. Kody Clark will be playing in his 150th OHL game this weekend. Kyle Maksimovich and Lucas Chiodo will be making their home debuts at TD Place on Friday night. Four of the top five leaders in the OHL for +/- are members of the Ottawa 67’s. Felhaber and Keating are tied for first (+35), Merrick Rippon is third (+30) and Marco Rossi is fifth (+28). Ever since coming back from injury, Austrian forward Marco Rossi has put up 7 points (2 goals, 5 assists) in 5 games.